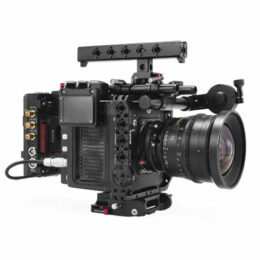 This sliding bridge connects the Tilta Camera Cage for Arri Alexa Mini’s battery plate to the long top plate in order to distribute power through the cage via internal circuitry. This allows you to use the optional Top Plate Power Connection Module and Top Handle Power Connection Module to power accessories from your top plate and top handle. It’s designed to be able to slide the battery plate away from the camera so that you have access to the buttons and ports on the back of the camera if needed and then slide it back for when you need a compact setup while operating.